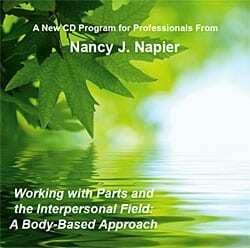 This audio recording is from a workshop offered by Nancy Napier for psychotherapists and other practitioners interested in approaches to trauma resolution that include a body-based perspective. It can be particularly challenging to work with clients when they are unaware of being swept upby trauma energy. This workshop provides practitioners with additional skills and a greater level of ease in working with parts, the interpersonal field, and their own counter-transference responses. “Parts work” involves accessing unresolved developmental andtraumatic experiences, which express as blocked energy and habitual patterns of activation and constriction. Some ego states represent early childhood trauma, while others emerge in later developmental stages. Many represent unprocessed trauma energy. “Parts”, include ego states, sub-personalities, imagined companions, dissociated “self-states” as well as non-trauma-based resource states such as the optimal future self. In this workshop, Nancy also focuses on the interpersonal field created between client and practitioner, and explores opportunities that arise to track trauma responses that spontaneously emerge within relational and transference dynamics. Corrective experiences are enhanced when brought into sensory awareness in vivo. Particular attention is brought to the capacity of practitioners to self-regulate and track their counter-transference responses, which enhances the containment and healing potential within the interpersonal field. Nancy also describes coupling dynamics, in which elements of experience become either entangled or dissociated in ways that prevent clients from moving beyond their traumatic experience. Hi Nancy, I really appreciate your work so was excited to see you listed on the social work continuing education site. Are these CD sets accompanied by CE credits? If not I’d be interested to learn any additional CE training you provide. Thank you! Unfortunately, the CDs aren’t approved for CE credits, but I will check on that to see if it’s possible. I’m happy to add you to my mailing list. I offer CE workshops from time to time and will make sure you get any future mailings. Thanks for your kind comments! I recently purchased the four CD set and you refer to handouts during your lectures on the CDs. Do you still have these available?